'Tis the season where goodwill and kindness abound. And there is no better way to show this goodwill and kindness in the teddy bear community, than by giving the gift of teddy bear hugs through Good Bears of the World. 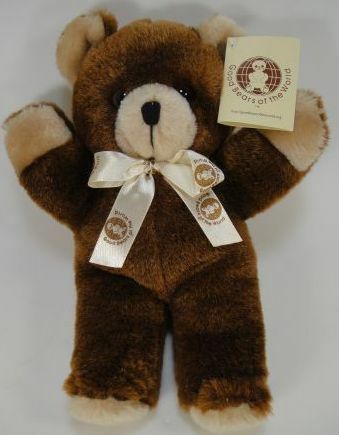 Good Bears of the World was founded in 1969 by the late radio pioneer, James Theodore Ownby, Colonel Robert Henderson and English actor, Peter Bull. What began as a dream by Mr. Ownsby to spread love and caring to children and to the elderly through the comfort of teddy bears has now carried on over four decades with hugs that reach around the world. Today, bear dens have been created worldwide with the mission to spread the love that teddy bears bring to those who need it most. Members of dens participate in teddy bear shows, bazaars, flea markets, craft shows and other fund raisers to raise money to purchase "Goodie," the Good Bears of the World brown mascot bear. Goodie bears and other donated teddy bears are then given to organization such as fire departments, police departments, shelters, nursing homes and hospitals to be given to those in need. We all know how special teddy bears are and how a warm hug can fight away fears and ease loneliness. Good Bears of the World has made it their mission to do just that for over 45 years. Bright Star Promotions, Inc. and BearsandBuds has proudly sponsored Good Bears of the World at teddy bear shows over the past 25 years and in numerous USA cities. It is an honor for us to help those in need and this holiday season, you can do the same. Please consider giving generously to Good Bears of the World. Purchase a Goodie Bear for someone you know or consider buying a case and donating it to a local charity. It's a small step that can make a big change to someone struggling through a tough time this holiday season. All donations are welcome and each donation will bring a big smile to the face of the recipient. Soft warm hugs are needed and your support is appreciate . From Good Bears of the World, Bright Star Promotions, Inc., and BearsandBuds, may the holiday season be warm and bright and full of teddy bear hugs. 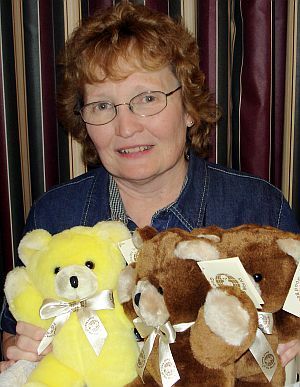 Terrie Stong is the Executive Director of Good Bears of the World. She along with her helpers, attend many teddy bear shows where they share the joy of gift giving. Monetary donations are always welcome, and you can show your support by joining GBW, purchasing a Goodie bear or a lapel pin. All are available where GBW exhibits at teddy bear shows or order or online. Wear it proudly to show you care.